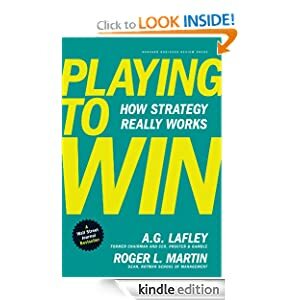 I was recently reading Playing to Win by A.G. Lafley and Roger Martin and realized that acquisitions and new initiatives only work when they build on your company’s existing skills. This insight sheds light on why some many acquisitions or extensions in the game industry fail. In order to win (to use the authors’ language), or what I would describe as building sustainable competitive advantage, the book shows you need to build systems that support winning. If an acquisition or new initiative requires different systems, however, being part of a company that wins in its space a different way can doom your efforts. This insight is crucial when considering an acquisition (either as a buyer or seller) or pursuing a new business unit. One of the themes of this blog, and my conversations with almost everyone, is that you need to have unique, sustainable competitive advantages if you are going to succeed. There are a lot of smart people, there are a lot of people who have raised investment, and if you think factors like these are going to make your company a success you probably need to start thinking about the next company you want to start because you will fail. Very rarely does a strategy of trying to be smarter than your competitor actually work. It is an arrogance that I have seen lead to the waste of millions of dollars of investment and years of sweat equity. Instead, great businesses are built by creating processes, technologies and other unique and non-replicable systems that make your product or services more valuable to customers (or cheaper) than your competitors. When reading Playing to Win, it reminded me of a frequent conversation I used to have with the co-founder of my first company, Merscom. We always recognized the importance of pivoting as the market shifted but frequently lamented that it was surprisingly difficult to pivot our business and we felt like we were at a disadvantage to younger companies that did not have the cash flow or experience we did. In retrospect, the difficulty arose because we built processes and systems to support our existing business and these processes were not tailored to where we had to pivot our business. Also, the skillset of our team was not focused on the skillset best for the new businesses. Although we were able to overcome these issues, they should not be trivialized as it made it very difficult for us to move into these new businesses and compete effectively. There are several implications of the insight in Playing to Win that businesses or acquisitions not aligned with your core strengths are at a competitive disadvantage. First, you should prune businesses that are not consistent with your systems and strengths. The authors cite the case of Procter & Gamble, which divested from about 15 businesses a year for ten years, including profitable brands like Folgers and Pringles, because they were not going to benefit from company reinforcement enough to sustain competitive advantage over the long term. Second, whether acquiring or being acquired, confirm that your core strengths are consistent with winning in the new space you are entering. You may have a great company, the acquirer or acquiree may be great, the culture may mesh perfectly, but if your core strengths and systems are not ideal for winning in the new space, the deal probably will not work in the long-run. If you are the acquirer, as much as you may want to get into the new space, you may not have the right organization to win in that space. If you are the company being acquired, although the deal may be financially beneficial in the short-term or sound great, if the parent company is not set up to win in your space, you are probably better off going after it yourself or looking for a different partner. Finally, as the Merscom example showed, it may be easier to succeed in a new space by starting from scratch than pivoting an existing organization. If you do want to win in a new space, you need to make sure all your systems and strengths are aligned with your strategy to win in that space.